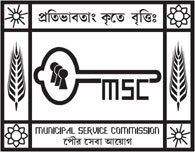 MSCWB Jobs Recruitment Notification 2018.Municipal Service Commission of West Bengal inviting applications for the positions of assistant engineer, sub-assistant engineer, accountant, cashier, clerk, typist jobs.Interested and Eligible candidates can apply for the positions. Last Date for Submission of Application is on November 02nd, 2018.. Number of vacancies to be filled in MSCWB is 10. Candidates those who have passed madhyamik or equivalent examination can apply for cashier, clerk and typist jobs. Degree holders in civil engineering can apply for AE jobs. Diploma holders in civil department may apply for SAE post. Graduation in commerce is the qualification for accountant post. Based on the performance in personality test/ interview contenders will be selected. Mode of applying for MSCWB recruitment through online mode from 17th September 2018 to 02nd November 2018.
http://mscwbonline.applythrunet.co.in/Signup.aspx?L=A is the link to register and http://mscwbonline.applythrunet.co.in/Login.aspx?L=A is the link to log in.